A Year of Being Here: Caroline Johnson: "Blue Sky"
You’ve already paid your dues. in the vase. Reach for a pen. but sit down. Close your eyes. your thoughts spill onto paper. Let’s pretend you are the newest star. Rescue your mind from a ditch. You are the healing waters. "Blue Sky" by Caroline Johnson. Text as published in The Prairie Light Review (2012). Presented here by poet submission. 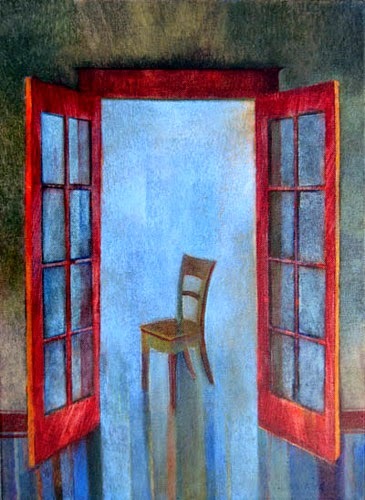 Art credit: "Blue Sky Doors," oil painting on canvas, by Michael Chambers.